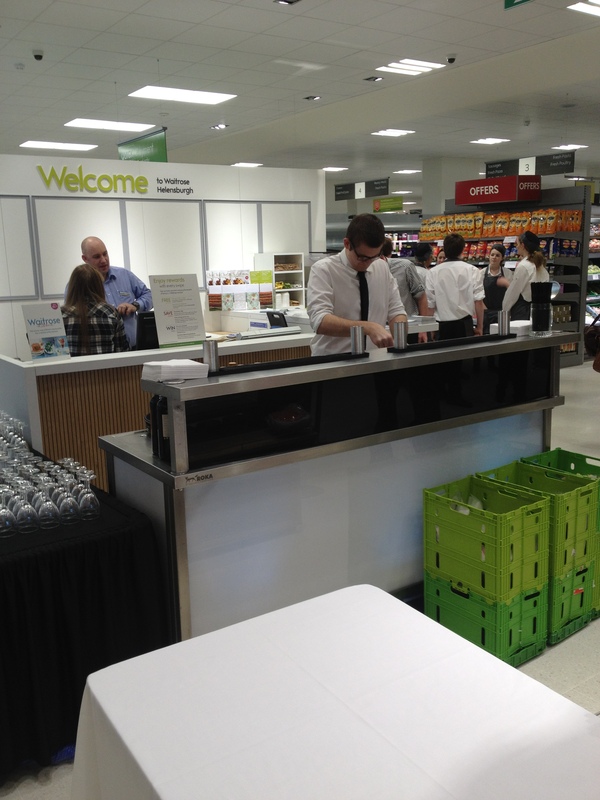 Reel Time Bars attended a new store opening of Waitrose last week. Mark and his team were on hand to set up and run one of Reel Time’s Pop Up Bars. After a quick setup Mark was ready to serve new visitors, staff and managers at the store refreshing drinks from the unique and stylish Pop Up Bar; with a white façade backlit by a range of colourful lights the bar neatly fitted Waitrose’s white concept store image. Situated at the entrance to the Clyde, the new store is the 300th Waitrose store in the UK and Reel Time’s friendly bar staff helped to serve customers creating a sense of occasion for this fantastic event. Reel Time was impressed by the new store with its neat layout and clean, inviting interior and hopes to return to Waitrose in the future. Thank you to the staff and customers at Waitrose who helped to make the day a success!